Memphis National Cemetery, located seven miles northeast of downtown Memphis, is the final resting place for more than 40,000 veterans. Interments span 125 years, from the Civil War to 1992, when the cemetery closed to new burials. The cemetery has the second largest number of unknown soldiers of any national cemetery, and is the final resting place for hundreds of victims of the SS Sultana, one of the worst maritime disasters in United States history. When established, the cemetery dedicated specific sections for soldiers of each state. Memphis, which is located along the Mississippi River, was crucial to maintaining naval superiority throughout the western theater of the Civil War and the Gulf of Mexico. The Union gained control of the city in June 1862, following the Battle of Memphis, which became known as one of the most dramatic battles of the war. The Union held the city for the remainder of the war, taking advantage of its transportation links and founding several hospitals in the city to care for up to 5,000 wounded troops from across the region. This large concentration of injured troops who died while in Memphis created the need for a cemetery in Memphis. A site, 32 acres in northeast Memphis was selected, and in 1867, the first burials were made. While originally called Mississippi River National Cemetery, the current name was given in 1869. The cemetery’s main entrance, at the west corner of the cemetery at the intersection of Townes Avenue and Jackson Avenue, consists of a double wrought iron gate with pedestrian gates on either side. Today, a four-foot tall brick wall with tile coping encloses the cemetery, except for a portion along the northwestern property line, which is marked by a picket fence. Just inside the main entrance, a small circular drive surrounds the cemetery’s flagpole. The cemetery’s layout consists of three avenues, all running parallel from the northwest to southeast. The central avenue is intersected at its midpoint by a circle that surrounds two semi-circular burial plots. The grave markers throughout the remainder of the cemetery are laid in orderly rows, parallel to the three avenues. The earliest graves at the Memphis National Cemetery are of Union casualties who died in the city’s hospitals, and battlefield reinterments from Tennessee, Kentucky, Arkansas, and Mississippi. The first superintendent’s lodge at the cemetery was a simple wooden cottage built in 1869. In 1934, a Dutch Colonial, two-story home with a gambrel roof replaced the cottage. Here the cemetery director resided until 1992, when the cemetery was closed to new interments. This lodge remains on site today, just inside the main entrance, adjacent to the administration building. Other buildings at the cemetery include two brick administrative buildings constructed in 1934, and a pump house dating to 1929. 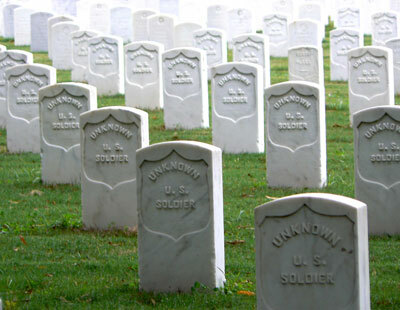 Memphis National Cemetery contains the second largest number of unknown remains of any national cemetery, with over 7,500 unknown soldiers. After the Civil War, the Army went about collecting soldiers’ bodies from battlefields and camps, and found many of the burial markers had deteriorated or become illegible. With no other identification, the remains were reinterred at Memphis as unknowns. Other unidentified remains from the SS Sultana tragedy are also buried here. The Sultana, traveling up the Mississippi River from New Orleans after the war in April 1865, stopped at Vicksburg to pick up recently released Union soldiers held prisoner in southern camps. Despite the ship’s limited capacity (it was licensed for only 376 passengers), between 1,800 and 2,000 crowded aboard. On April 26, the ship stopped near Memphis to pick up additional coal stores when one of the three overworked boilers exploded, obliterating the ship and claiming an estimated 1,537 lives, many of whom are buried in the Memphis National Cemetery. Several memorials also mark the landscape of the cemetery. The Illinois Monument, erected in 1929 in Section B, consists of a pink and black granite base and sarcophagus, surmounted by a bronze figure of a deceased soldier lying atop a bier. The state of Illinois paid for the monument to honor its residents who volunteered for service during the Civil War. Also within the cemetery grounds is the Minnesota Monument, designed by St. Paul sculptor John K. Daniels, dedicated to Union soldiers from Minnesota who died while in the South. The monument was erected by the Minnesota Monument Commission in 1916. The 16-foot tall bronze sculpture depicts a Union soldier, head bowed, with his cap held against his heart and his hand resting atop his rifle, barrel pointing downward. An identical monument is located in Andersonville National Cemetery. The Minnesota Monuments at Nashville National Cemetery and Jefferson Barracks National Cemetery, also designed by Daniels, both feature a female figure holding a wreath. Regimental Minnesota Monuments were erected at Marion National Cemetery, Shiloh National Cemetery, and Vicksburg National Cemetery. Other smaller monuments at the cemetery include the bronze plaques dedicated to the 1st Marine Division and Jewish War Veterans. Memphis National Cemetery is located at 3568 Townes Ave., in Memphis, TN. The cemetery is open for visitation daily from 8:00am to sunset; the administrative offices are open Monday to Friday from 8:00am to 4:30pm, and are closed on all Federal holidays except for Memorial Day and Veterans Day. For more information, please contact the cemetery office at 901-386-8311, or see the Department of Veterans Affairs website. While visiting, please be mindful that our national cemeteries are hallowed ground. Be respectful to all of our nation’s fallen soldiers and their families. Additional cemetery policies may be posted on site. 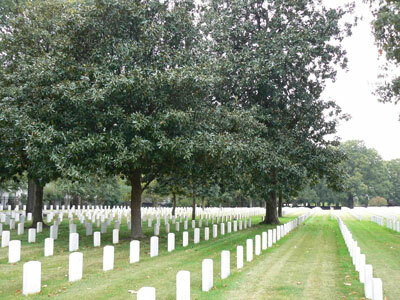 Memphis National Cemetery lies within the Tennessee Civil War National Heritage Area. Memphis National Cemetery was photographed to the standards established by the National Park Service’s Historic American Landscapes Survey.